Our guest author, Kyle, kneels to the left of Quinn. In writing this blog I have done exactly what I tell my students not to do – I started with the title. When I began thinking about a blog post for the Mt. Liberty hike, I became fixated on Patrick Henry’s famous line, “Give me liberty, or give me death.” What a perfectly fitting title for a blog post about hiking Mt. Liberty on September 11th. As I procrastinated on writing this post and waited for a source of inspiration, I reassured myself that at least I had a great title. Then I realized that this ultimatum might send the wrong message. I don’t know that Quinn would be too happy with me if I’m running up and down the mountain yelling, “Give me Liberty or give me death.” Bad idea. I did some more thinking and realized that I didn’t even really know anything about Patrick Henry or his speech. About all I remembered was that Henry’s speech convinced Virginia to join the Revolutionary cause. With still no idea what I wanted to say in this blog, I read Patrick Henry’s speech (1775) and found the inspiration I was looking for. In the third paragraph of his speech, Henry says, “I have one lamp by which my feet are guided, and that is the lamp of experience. I know no way of judging the future but by the past.” If Patrick Henry had known Quinn, he may have added a second lamp. However, with Henry’s message in mind, I look to Saturday’s hike with an eye on the past. 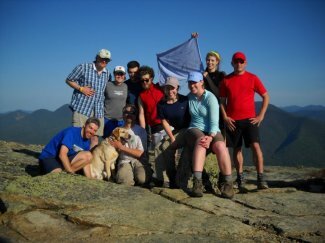 Last May I was lucky enough to spend a week in the Pemigewasset Wilderness with Randy, Quinn, and a group of UNH backpackers as a part of Brent Bell’s Outdoor Education course. It is an experience I will remember for the rest of my life and certainly not one I can do justice to in a short post. On our Pemi hike, I learned a great deal about Randy, Quinn, and myself that gives me a deep sense of confidence and excitement approaching this weekend. First, I know that Randy and Quinn have the physical ability to climb Mt. Liberty. I saw them struggle up Bondcliff, Mt. Bond, and South Twin Mountain – three four thousand footers. Randy was exhausted, perhaps as tired as I’ve ever seen someone standing on two feet, yet he made it. Quinn fought through some nasty chafing and a significant paw abrasion that when discovered at the Guyot shelter left me feeling an increasing sense of despair. “This was a bad idea. We’re in over our heads,” I remember telling others. As a self-proclaimed worrywart, I feared the worst – emergency evacuation. Then Quinn started working, taking the pain, and leading Randy through a two-mile, post-hole minefield that was the Twinway trail. That gets me to my second point: Courage. I’m fascinated with the concept of courage – both extreme and every-day acts. Those who know me well know that I’m a positive person. My glass is half-full and I believe strongly in the infectious nature of optimism. For this reason, I’m drawn to courage, to people who don’t complain but instead put their head down, grit their teeth, and keep on going. On the second day of our Pemi hike, this was Randy. I distinctly remember passing Randy on the saddle between Bondcliff and Mt. Bond. It was probably around 7pm and though I had tunnel vision – we need water – I remember looking at Randy as I passed him. He was extremely fatigued. He was soaked in sweat and covered in dirt. His arms and hands were shaking. His eyes were looking for a million things at once. I remember being very worried, as scared as I’ve ever been on a mountain, but I also remember feeling an incredibly sense of inspiration. Randy had nothing left in the tank, but he kept on going. No complaining. No, “I can’t do this.” Perseverance. Courage. Mental toughness. As we approach Mt. Liberty, I take comfort in these qualities. Third, I have confidence in our team’s ability to do the right thing. Though I realize that ultimately I will have to call the shots, I know that Randy and the team will have my back even if it’s not what they want to do. On the third night of our Pemi hike in May, I led a serious discussion about our options moving forward. We had gotten to Galehead Hut sometime after 8pm and a 13 hour day of hiking featuring a rugged 3 ½ hour .8 mile from South Twin to the hut. After back-to-back hiking days of 14 and 13 hours, I didn’t think it was a good idea to continue our original route. I suggested that Randy, Quinn, and others take a down day at the hut and that finishing the loop as planned didn’t seem reasonable. Using Quinn’s paw and Randy’s exhaustion as a scapegoat, we voted for a down day and an altered route out of the Pemi. Though Randy may have had a bruised ego and more likely just downright felt really bad about impacting the group experience, he let us make that decision. It wasn’t the most popular decision but it was the right decision. Looking ahead to Mt. Liberty, if we aren’t sitting on the summit flying our flag at 1:30pm, I’m ready to make a decision and confident that it will be the right one. I’m excited to once again hike with Randy, Quinn, and T.J, and looking forward to meeting and getting to know the rest of our team. We have a long, challenging day hike ahead of us, but I am eager to begin. I’m confident that we will be sitting atop Mt. Liberty next Saturday, but I’ll be ok if we can’t get there this time. Finally, I dedicate my participation in this hike to the members of my family actively serving in the armed forces. Todd, Billy, Johnny, Tyler – Thank you. I’ll be thinking about you. I know how excited I am for this trip but I bet the Mighty Quinn will be thrilled to see his buddy Kyle again! Thanks for the great post Kyle! That was indeed an incredibly hard day over Bondcliff, Bond and down to the Geyot shelter. My Nystagmus and Vertigo were the highest point since I’ve been walking again. There was so much support that day and that entire trip in the Pemi! I love what we accomplished and cannot wait for my chance to take that route again and this time accomplish more…but that’s a few hikes from now! Spring into action and Save the Date: The Final Peak Potential Dinner and Auction! All about Autumn on this five-year anniversary! Winter Walking? March Forth and Protect those Paws! Recoveryedia – An inspiring platform for hope and positivity! Melissa French on What we need to succeed: Your help with our book! Copyright © 2019. 2020 Vision Quest. All Rights Reserved.